Nishant Chaturvedi...: Bilawal’s rant for ‘Kashmir’ is his passport for Security in Pakistan ? Bilawal’s rant for ‘Kashmir’ is his passport for Security in Pakistan ? Answer to the above questions lies in another important question? Which is, who were the audience that Bilawal was addressing to, when he talked the ‘K’ word? It was definitely not for the people of the backward area of Multan who are still trying to come out of the destruction caused by the recent floods. ‘Kashmir’ is and has been the favourite word of the intelligence agency ISI & the Army of Pakistan. It seems that the young Bilawal’s rant for every inch of Kashmir was addressed to this particular audience. The reason behind it is simple, as many in PPP privately talk and hold the then ISI & Army responsible for Benazir’s assassination! It is no surprise that Bilawal is talking the language which is pleases the ears of the ISI and the Army. So yeh dil mange Kashmir speech was his passport for security in Pakistan. The young Bhutto is indeed trying his best to step into the shoes of his mother Late Benazir Bhutto. Bilawal Bhutto (26) is not new to politics but his inexperience is obvious and plastered on his script reading skills. Irony of politics is that inexperience and lack of ground work usually ends up a Politician into a ‘Political Actor’. Its often said that ‘an actor is as good as his script’ but strangely that does not apply on ‘Political Actors’. 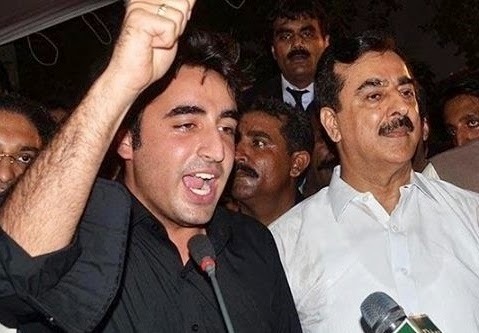 Bilawal was given a strong political script on ‘Kashmir’ but his inexperience was obvious in his script ranting, even his act of enthusiasm couldn’t cover his nervous script reading. Dear Mr. Nishant, Please disregard my previous comment. You are a good journalist man. You have good presentation skills and delivery. All that you need to be succesful journalist in this day and age. But the content of the news cast? well, that's a different story but then again that's not really within your control now, is it? I didn't really mean all that I said before. I was just ticked off regd. all these Channels being subscribed and biased towards promoting divisive forces in the country which ordinary journalists have no clue about the overall direction and selectivity of news and the way it's put forward all being propelled by extraneous politcal compulsions which in turn again is being masterminded by anti-people negative forces from outside of the country. I do understand you are simply doing your job and I am wrong to lambast a professional such as you for airing your political views even if I don't agree with it.